We reached the town just after three in the afternoon, and as all the towns and villages in this southern region of Italy it was eerily quite and its streets deserted, people here take their afternoon siestas seriously, most shops and public places were closed. We parked the car not far from a small square close to a park where we saw a group of elderly men and women sitting on the benches chatting. The historical centre was a fortified part of the town that had bastions and high walls and where you can enter the town centre through particular gates in the walls. Everything was shining under the afternoon sun.They say that the town expanded a thousand years ago after a flood of refugees fleeing the coastal areas settled behind its fortified walls, running away from the naval raids on their towns. After few minutes of walking aimlessly in narrow alleys and through empty squares, we arrived at one of the many piazza in the town town, shaped like a semi-circle. There was little we can do until the place rises up from its afternoon slumber, so we sat outside a coffee shop that was just reopening for the evening. As we ordered coffee we noticed an interesting coincidence about the place, its name was Caffe Tripoli. During the last few years the nostalgic image of a pristine, elegant and cosmopolitan Tripoli, as well other urban centres in Libya, was gaining a popular revival among a young urban minded and middle class Libyans who were longing to be identified as modern and sophisticated and possibly in response to the dominance of anti-modern, anti-urban and regressive values of the Gaddafi regime that didn’t hesitate to show its hostility and disdain to the “City” as cultural state of mind and physical existence. Most young Tripolitans began rediscovering and inventing an urban identity that is more closer to the north side of the Mediterranean and to the former colonisers than with their fellow citizens coming few miles from the hinterland. In their pursuit to cultivate this identity and narrative, they began connecting with the images and stories of the past. The Libyan blogosphere and more recently social media became a space to explore and celebrate this past, mainly through photography, films, publications and music recordings. Many Facebook groups were launched to collect and showcase images of bygone eras. Photographs of common Libyan men and women dressed elegantly walking the streets of a shining, clean and tidy Tripoli became a source of nostalgic comments and longing to a past none of the of young Libyans ever experienced, and only heard about from their parents and grandparents or from gazing into buildings and landmarks from the colonial past that were still standing in the city. Among the many old photographs that gained popularity was a particular one showing a beautiful woman in a black dress walking in a street while four young smiling men stood drinking coffee at the entrance of a shop behind her and you can clearly sense from their expressions that they were admiring the passing lady. What made this particular picture popular among Libyans is the name of the shop clearly visible above the standing men in this black and white picture, it was Caffe Tripoli. Many Libyan internet users assumed that this is an image of a coffee shop in Tripoli taken maybe during the colonial era or as recent as the 1960’s when the city enjoyed a period of social and ethnic diversity while Libya was going through its most dramatic social transformation driven by the discovery and import of a huge reserves of oil. The picture later turned out to be one of several taken by the Italian photographer Ferdinando Scianna for a promotional calendar for the Italian coffee company Lavazza for the year 1996 and showed the Italian model and actress Maria Grazia Cucinotta outside a Caffe Tripoli in the town Martina Franca in the Southern Italian region of Puglia. 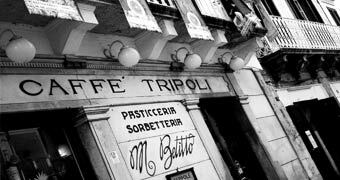 So While we were ordering coffee in this old establishment named most probably to commemorate the Italian conquest of Tripoli more than a century ago, I couldn’t but think about the many customers that sat sipping coffee in this hot afternoon oblivious of the shop’s little connection to a city and people on the other side of sea.